He's the Eastern Conference bogeyman, haunting the dreams of ballers East of the Mississippi as the Freddie Kruger of hoops. Two fellows are enjoying a tankard of ale in 16th century Rome, complaining about their arranged marriages and the plague of carriage travel when talk inevitably turns to Michelangelo. At this point the second fellow grabbed his deluded buddy, dragged him for a half-century, plopped him in front of a television and – after explaining the relevant rules – showed him LeBron James his first eight games of the 2017 playoffs. The metaphor’s collapsing into a singularity but the truth that barely escapes is that we are witnessing something legendary that will be talked about for decades to come. There was some sense that LeBron James peaked in his late-twenties, during his Miami tenure. Maybe that’s true, but if so we’re enjoying one of the most extraordinary Indian summers of a basketball career. We understood last year’s final three games as something truly special. But the way James has played during this series makes you wonder if that was just the prelude. Sure, Golden State got Durant, but LeBron got a challenge, and LeBron loves a challenge. Right now that deal’s looking like a wash.
LeBron heads to his ninth Conference Finals since joining the league and perhaps on his way to his seventh straight Finals. Only Michael Jordan and Bill Russell have witnessed stretches of dominance comparable to James, each roughly two decades apart. But really, it would appear that nobody has ever seen anything like LeBron James. He is Neo. He is the one. Obviously however hard James works during the games, playing four times every two-and-a-half weeks is hardly a killer pace. He did it by teaming with Kyrie to score 37 of the team’s 48 second-half points. You know when James gets tired because he stops driving and starts taking jumpers. That used to be something opponents dearly hoped for, but even with (perhaps) tired legs he sunk 4 of 9 threes, accounting for the vast majority of his 13 second half points. Please note some of this is Tristan’s fault, since opponents essentially turn his defender into a rim-goalie and clog the lane forcing James to shoot more jumpers. He seems willing since he’s shooting 59% from two and 49% from 3, including 60% on long jumpers (16’ to the arc). 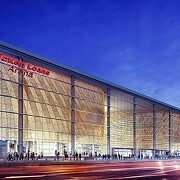 As a result of that Lue used Love and Frye at center for a good long stretch in the first half, including when Kyle Korver turned into Johnny Storm (aka the Human Torch) and rained fire on them, scoring nearly half the Cavs 33 points in one awe-inspiring quarter, as Lue stuck with the hot hand and played Korver all quarter. Korver finished with 16 on 6-8 shooting including 4 triples, almost single handedly outscoring the Raptors who posted 21. The first one is a classic as the play (out of a timeout, natch) uses Thompson who appears to head to screen for Williams. Instead he detours and sets a screen for Korver’s pin-down cut from the baseline. Since TT’s man rarely follows him to the arc, there was nobody on the other side of the screen letting Korver sink it. Indeed, Kyrie is the only guy on the Cavs shooting under 40% from 3. Yes, you read that correctly. Irving’s 28% from 3 is the lowest by a long shot, with Shumpert (40%) and Love (40.5%) the next-closest Cavaliers. That should strike a lot of fear into Cleveland’s opponents. As if anything could scare them more than how LeBron James is playing? Well, maybe one thing. Even amidst a poor game in a poor playoffs, Kyrie demonstrated that if coffee is for closers, you should call him Juan Valdez. If Mr. Wolf isn’t available, you call Mr. Irving. Toronto had just pulled ahead 93-92 when Kyrie took over. He had a mediocre shooting game (10-24, and improvement after going 13-40 last two) but had 9 assists, giving him 34 over four games, showcasing his growing maturity and willingness to take a bad seat until it’s his turn. Kyrie outscored the Raptors 11-2 over that 135 second stretch, putting the game out of reach. Whatever his faults, he is one of the league’s most devastating one-on-one players. If his handle were in a videogame you’d say it was OP (overpowering), because really he can go anywhere he wants. It’s what allows his unorthodox pick-and-roll manner. As you might imagine, this is one of the shortest sections ever, as this postseasons worries have evaporated like one of the Cavaliers regular season leads. We jest, but in truth the team’s turned the switch just like Casey said. They’ve started playing harder. Deron Williams started doing better once he dropped 15-20 pounds. (Amazing how much it helps playing defense if you’re a hair quicker.) It’s hard to understate how much the lack of continuity seems tied to the fact that almost the entire bench hadn’t arrived until March, at which point they had a ridiculous dozen road games. So not only were the Cavaliers integrating five new guys, but without practices and struggling against the end-of-year torpor. It’s no excuse for their poor play the last six weeks, but it is a partial explanation. It’s easy to sort of laugh about it now that we’ve seen what this team can do when it focuses. We were concerned with Love’s disappearance again in the second half. He only took one shot and managed two rebounds in 15 minutes of second half play. Love’s played pretty well as a whole, and a closeout game is a uniquely LeBron and Kyrie type of show, but it would assuage a few worries if they’d find a way to keep Love better involved in the second half of games. On the other hand, Frye, Korver, Williams and, yes, even Shumpert have been playing so well, it’s hard to complain (but sometimes we still do). We’re a bit concerned about the team’s proclivity for threes. When you’re shooting 43.4% (6% better than the Warriors and 2% more than next closest team) from three, and have the best overall shooting percentage there’s a tendency to get complaisant. We’ve seen stretches where the Cavaliers fall too in love with the three, and 41% of the team’s total shots is a little nuts. But it’s working, and you don’t stop success until it stops working or someone stops you. 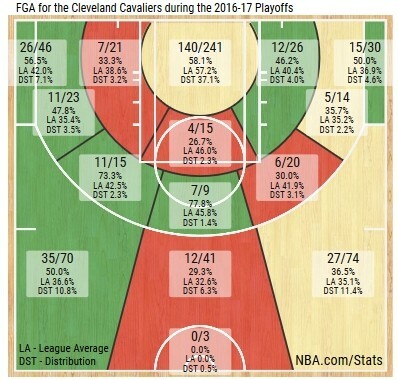 Looking at their shot charts from the playoffs so far, LeBron’s strong start is almost inescapable, as he’s responsible for much of the shooting on the left side of the floor (while Kyrie’s troubles are what’s sinking the right side of the floor). 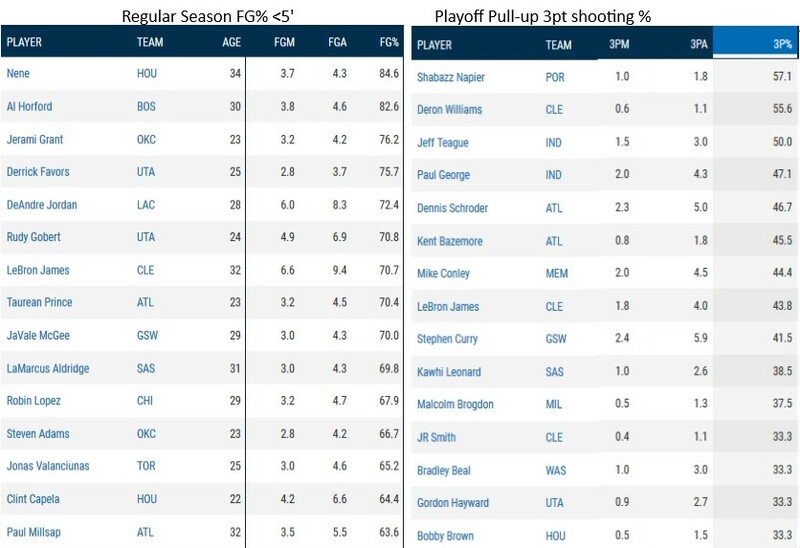 It’s worth noting that the Cavaliers are shooting only a little above league average from within 5’. They are also taking the second least shots from there (24.3), ten less than the Rockets and a dozen less than the Thunder. The Cavaliers have demonstrated such strong shooting from distance; we’ll worry about the shots at the rim when the former becomes an issue. No, we’re serious. They’ll need to pick up the inside play, but until someone stops them from dialing up long distance like college freshmen, the Cavs shouldn’t worry about it. We’ll cross that bridge, etc. Meanwhile the defense we all worried so much about has acquitted itself pretty well. Neither is an offensive juggernaut, but the Raptors were quite successful with their iso-oriented offense. Still, it looks like the Cavs will reach the NBA Finals without facing a real defensive challenge. Thankfully the offense is scary good, especially with LeBron's recent transcendence. Through eight games, the Eastern Conference doesn’t look any tougher. That doesn’t mean the teams haven’t improved; the whole conference has, Cavaliers included. 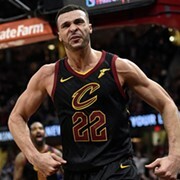 Considering the high IQ and still strong skills, it’s probably true that this Cavaliers team has as much talent as James has ever had around him. Williams and Korver could still start and be a feature player on a contender, and don’t play as many minutes as LeBron combined on a slow night. Frye is limited but in doses poses huge matchup difficulties. Hell, Richard Jefferson can’t even make if off the bench. Even Shumpert has found a higher level. Whatever Golden State, San Antonio or Houston has, none of them have the G.O.A.T. Bet against LeBron at your own peril. We still see the Celtics topping the Wizards, but it should go seven. We wouldn’t want to have to hold homecourt against a rested LeBron in Game 1. On the other side, we still see the Rockets as beating the Spurs, and the Warriors advancing, though we feel either could pull an upset. Still, the way the Warriors finished off the Jazz in Game 3 (after leading only by 1 going into the fourth) certainly seemed familiar. We had a vague inkling the Cavaliers were going to repeat, but it was impossible to explain. Now that we’ve seen the greatest Playoff LeBron we’ve ever seen, we know it’s not a miracle. 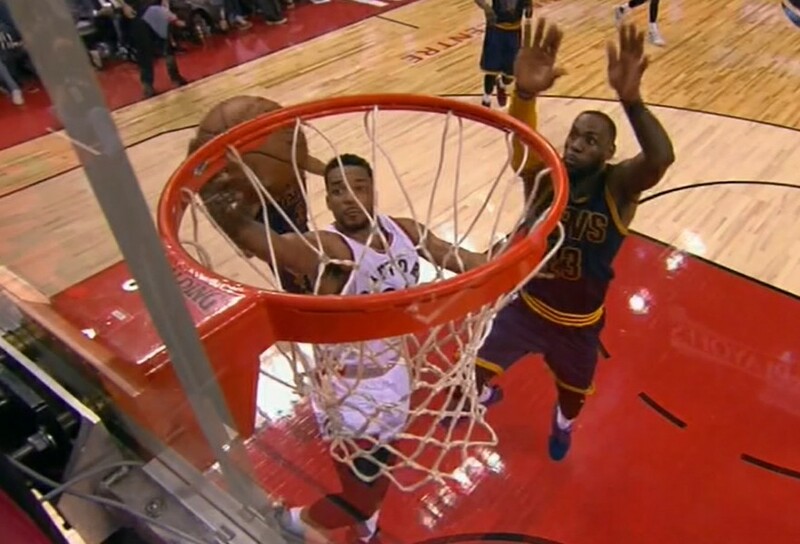 It’s just King James, having his way. You can follow us on Twitter @CRS_1ne, a sort of homage to rapper Kris Parker, aka KRS-ONE. You can hear us nearly every Monday on the Defend Cleveland Show on WRUW-91.1 at 11 a.m. (but not this morning as fortune would have it). And you can find the Definitive Chronicle of the Cavaliers 2016 Title Run, aka King James Brings The Land a Crown at CavsChampions.com, where you can find pictures, reviews, celebrity testimonials and buy signed copies of the book. Your support is appreciated. Look for another of these next week when we know the Cavs' foe.